Virtual Sailing Pty Ltd is an Australian company that for over 10 years has invested significant time and resources into developing a ride on sailing simulator, which replicates several classes including the Laser and 29er sailing dinghies. The simulator provides a means for training and performance assessment of sailors, including the feature of providing rehabilitation and training for disabled body sailors through the V-Sail Access Simulator. Previously much effort has been devoted to system identification of larger marine vessels; this is not the case with small sailing craft that are being replicated by the simulator. The need for a validated simulation model, combined with reducing costs of computing technology, has led to the creation of a wireless manoeuvring measurement network. The developed network has been shown to be of great use to the difficult scenario of a small sailing vessel operating in a harsh environment. This has a potential to be used on many different platforms. 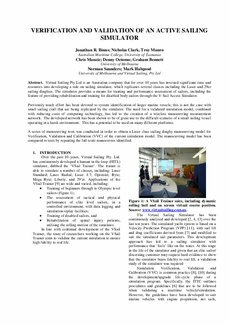 A series of manoeuvring tests was conducted in order to obtain a Laser class sailing dinghy manoeuvring model for Verification, Validation and Calibration (VVC) of the current simulation model. The manoeuvring model has been compared to tests by repeating the full scale manoeuvres identified.